Don't you really appreciate the phrase "the splendor of his holiness" and long to behold that splendor? It conjures up reminders of Isaiah's encounter with God in Isaiah 6 or John's vision of Jesus in Revelation 1. 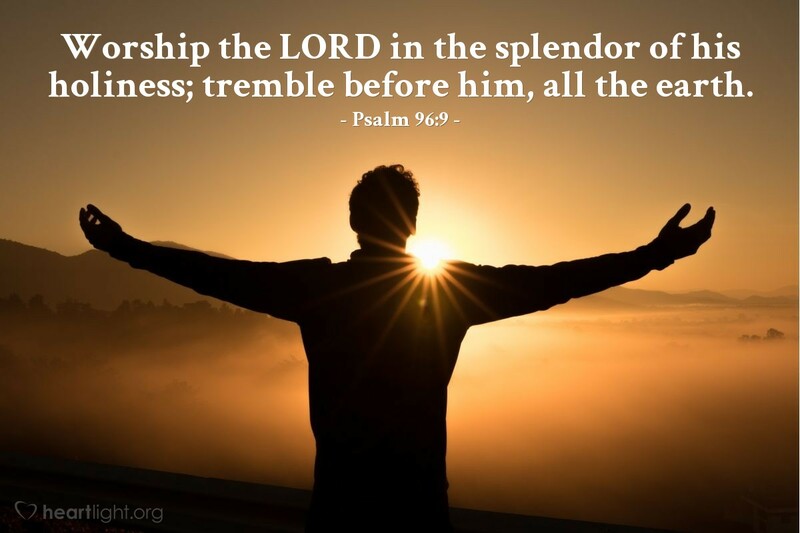 God's essence — known in the Old Testament as his glory and his holiness — can be described only as splendorous! Our only fitting response is to join the angels of Isaiah 6 and the twenty-four elders around the throne in Revelation and worship God and cry, "Holy, holy, holy, is the Lord God Almighty. The whole earth is full of his glory." You are holy, majestic God, more than my mind can grasp or my imagination can dream. I worship and praise you for your glory, might, grace, and mercy. I hunger for the day when I can see your splendor face to face and join the angels of heaven and the twenty-four elders in never ending worship and praise. Through Jesus I offer this praise and my life. Amen.